(ID 2986) in 1918; Renamed Freight Lighter No. 94 in 1918; Reclassified in 1920 as YF-94; Placed out of service and disposed of in 1947; Struck from the Navy Registry, (date unknown). Fate unknown. Specifications: Displacement 500 t.; Length 100' 6"; Beam unknown; Draft unknown; Speed non-self propelled; Complement unknown; Armament none. 75k Barge No. 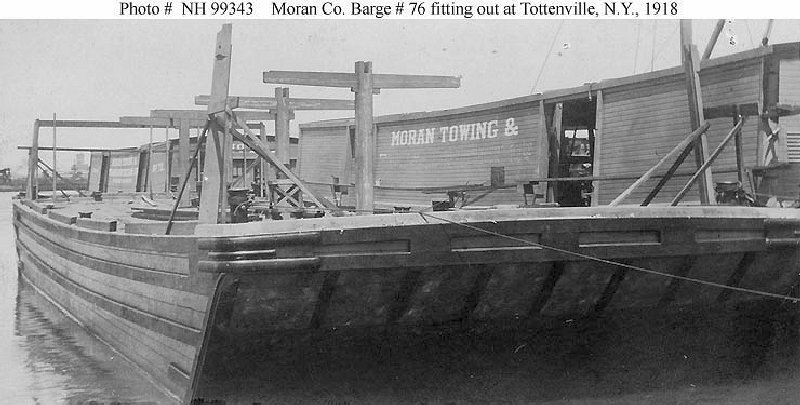 76 fitting out at the Harry Cossey Shipyard, Tottenville, New York, in 1918. Barge No. 72 is partially visible in the left background. There is no DANFS history currently available for Barge No. 72 (ID 2986).